Are you looking for a doormat made up from an off cut of carpet you have lying around? Then look no further. Our carpet binding service, also known as carpet whipping service will finish off the edges of your unused carpets. This will make them into a cheap rug alternative. 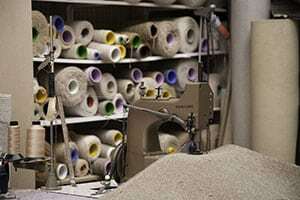 When you bring your off cuts of carpet into us we can give you an estimate of price. To make life easier for you we can even cut the carpet for you, at no additional charge. 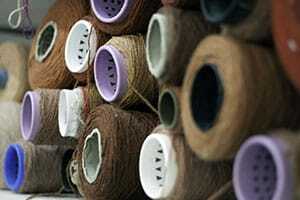 Carpet binding, also known as carpet whipping sits on the very edge of the carpet. Don’t worry, it doesn’t add any extra to the size. This edge then stops the carpet from fraying and becoming unsightly. Not only does it prevent any damage to the carpet, it also looks more attractive. Our workshop can cater for carpets up to 4m x 4m. We can do carpet binding on intricate shapes which includes carpets for (but not limited to) yachts, vans, motor homes, and car mats. When working with shaped carpets all jobs are priced per piece. If you don’t have any templates handy, we can come to you to create a template for almost any job. A very popular use for carpet binding is one stair runners. These runners have an even space both sides and the runners are whipped around the edge to protect the runner. When this is done correctly, the runner will be the focal point of the stairs with the painted or stained stairs creating a classy look. Nowadays, people don’t just stop at stair runners, they have runners that continue from the hall, go up the stairs and finish on the landing. All of this can be put through our machine to give you the perfect whipped edge. It’s hard to find rugs for rooms that are extra large. The rooms are irregular sized and a standard sized rug would look out of place. Our ability to edge carpets up to 4m x 4m allows more flexibility when choosing the size. Not only is it cheaper to have a piece of carpet made into a rug for extra large rooms, it’s also easier to find!